uses Kirsch or Kirschwasser. Kirsch is made from the Black Morello Cherry and is made in the Black Forest Region of Germany. I have wanted to make an Authentic Black Forest Cake since December when I saw a beautiful and very tempting Black Forest Cake at a local bakery. Kirsch, also called Kirschwasser is a dry, colorless Brandy distilled from the fermented juice of the Black Morello Cherry. Kirsch is made in the Black Forest Region of Germany. Its production methods remain traditional. Fully ripened cherries are mashed in a large wooden tub or vat and allowed to ferment. When the fermentation process has completed, the entire mass, liquid pulp and cherry stones are distilled in a pot still. the same liquid that comes off the still. It is a fruit brandy with a clean, cherry fragrance and bitter almond taste. Kirsch is consumed “neat” as a brandy and is used in many cocktails. Kirsch is also used in cooking as a flavoring. 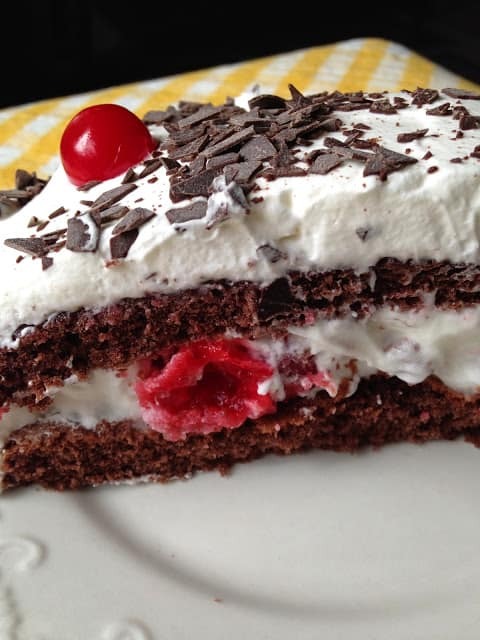 There are many ideas on how Black Forest Cake got its name. Some historians say that it got its name because Kirsch the liqueur used to flavor the cake, is made in the Black Forest. just like the dark chocolate shavings, their blouses white and billowing, like the whipped cream and their hats were topped with red pompoms that looked just like the cherries. Black Forest Torte also known as Schwarzwälder Kirschtorte. This exquisite dessert hails from Swabia in Germany’s Black Forest region. It’s made by layering kirsch-scented chocolate cake, sour cherries and kirsch-laced whipped cream. 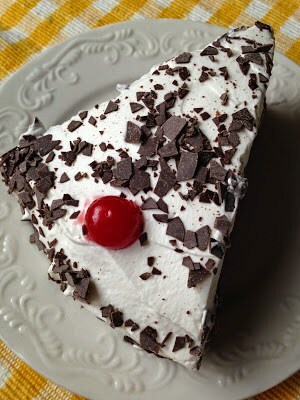 Then it’s coated generously with sweetened whipped cream and garnished with chocolate curls and cherries. I have always been a little intimidated by the many steps involved in the traditional recipe for Black Forest Cake. Not only are there several steps involved when making this cake it takes some time…mainly because the cherries need to soak in the Kirsch overnight and the cake needs to sit in the fridge for a day or two…to allow the kirsch to soak into the cake but if you have the time…this cake is sooo worth it!! The cherries need to soak in kirsch overnight. There are 2-4 layers of chocolate sponge cake, each cake layer is brushed with kirsch. The cake needs to sit in the refrigerator overnight or longer. Each cake layer has a layer of soaked cherries and layers of fresh kirsch flavored whipped cream. The cake is frosted with more kirsch flavored whipped cream. The whole cake is then covered in dark chocolate shavings and a few whole cherries, with the stem left on, gives the cake a dramatic effect. 4. Dark Chocolate shavings only. 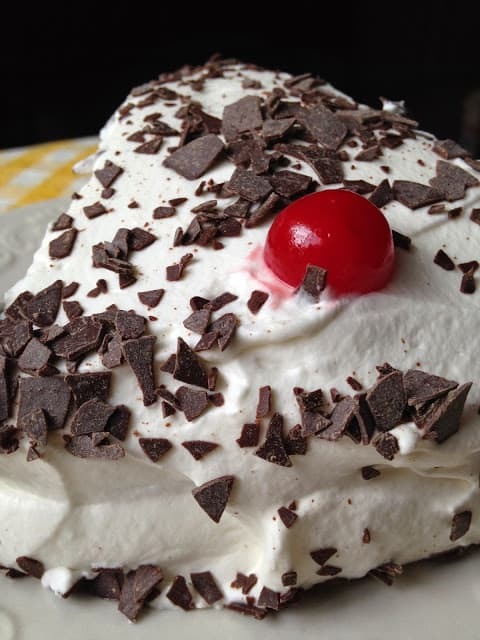 I had wanted to make an Authentic version of Black Forest Cake and decided on this recipe from Bekah Goertzen. 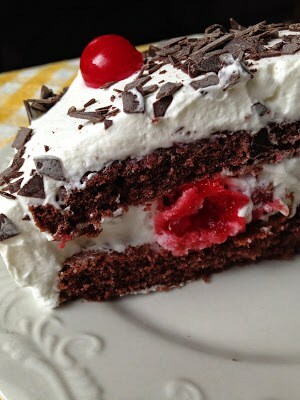 I found her recipe for Black Forest Cake on Food.com. 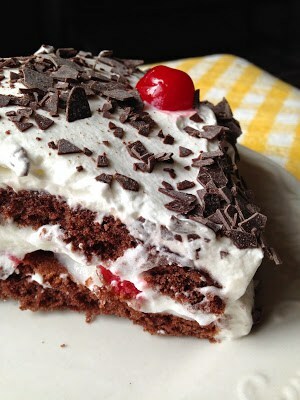 Looking further into her recipe, many cooks have made her recipe for Black Forest Cake. I have made an Easy Black Forest Cake which is excellent and guaranteed to disappear fast..but by German standards, it’s a far cry from the “real” thing. Pit most of the cherries, leaving about 10 whole, with stem on, for decoration on top of cake. Cut the cherries in half, set aside. Take the pitted cherries and soak them in a jar with 1/2 cup of the kirsch, overnight. Line the bottom of three 9-inch round cake pans with parchment paper. Sift the dry cake ingredients together; flour, cocoa powder, baking soda and salt. Cream the shortening and sugar. Add the eggs and vanilla extract. Mix well. Add the dry ingredients alternately with the buttermilk and mix well. Pour batter evenly into the prepared pans. Remove cakes from the oven. Let stand in pans for 5 minutes. Remove cakes from the pans and cool cakes on wire racks. When cool, prick the tops of the cakes with a toothpick. Pour 1/2 cup kirsch. (that the cherries soaked in) onto the cake. Let stand while you make filling. Make Filling: In a bowl beat the butter until light and creamy. Add the icing sugar, salt and espresso, mix well. If the filling is to thick, add a few drops of kirsch. Place one cake layer on top of your cake stand. Spread 1/2 of the filling over the top. Cover filling with cherries and top with another layer of cake. Spread the second half of the filling over that layer of cake. Cover with cherries. Top with the third layer of cake. Cover and let sit in the fridge for a day or two to allow the kirsch to soak into the cake. Whip the cream until stiff peaks form. Gently fold in the dry milk and icing sugar. Add the vanilla and pour in the kirsch until its of good spreading consistency. Spread the whipped cream over the cake. Make small mounds of whipped cream on top of cake for decoration. Place the cherries with stems on small mounds. I wanted to make one too. Seems very tricky. 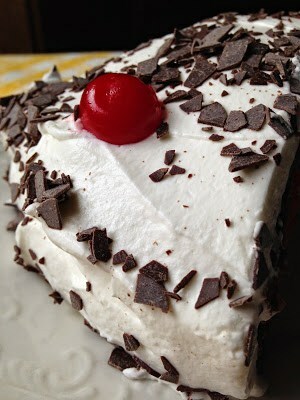 Black forest cake brings memories of me and mum. 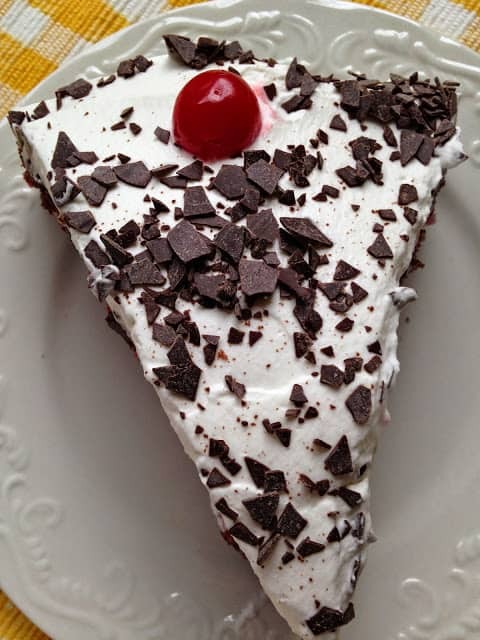 Your Black Forest Cake looks fantastic, could I have a slice right now? Thanks so much for sharing with Full Plate Thursday and have a great weekend.